1. Heat a dry wok and cook the mince over a high heat for 10 minutes until golden. Meanwhile, prepare the dressing by stirring the passion fruit, sweet chilli sauce and lime juice together. 2. Tip the pork onto a plate lined with kitchen paper and let any excess fat drain away. Return to the pan, stir in the curry paste and garlic then cook for a further minute. Add the noodles and a splash of water and use tongs to make sure that everything mixes well. Once the noodles are hot, add the shredded onion and the mint. Season to taste. 3. 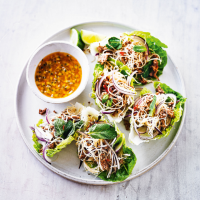 Serve the mince and noodles using the lettuce leaves as cups, with the remaining lime wedges for squeezing and the dressing in a dish, ready for spooning over. Cook’s tip Quorn works well with these flavours – try swapping the pork for a 350g pack Quorn Mince if you want to make this recipe vegetarian.